I have PS, PC, PR, DO, BB, and AS. To be honest BB is my second favourite modular building after PR and the one which convinced me to start collecting this serie. I really don't like DO and DD with it's cartoonish look. PR and BB are two serios buildings that look great next to each other. I prefer the new era of modulars with more detailed inside and these two perfectly match my taste (I never really liked the first modulars). To me BB is like a small, discrete but very exclusive bank similar to those I saw in Switzerland. I hope you are right Zero. There must be something very special in this set. It is quite big and for what purpose? Only to have a simple working bucket in front of it? Probably the new PF stuff is hidden in the prelim picture (think of 9398 prelim). What is your most sought after Technic set? Mission completed. I've managed to purchase a MISB Auto Engines 8858 set and I am very happy with it. I've bought 42070 MISB two weeks ago from a private source for 175 EUR. I think that is the price this set should be sold in the stores. Holy Grail, Dream and Regret sets/parts? 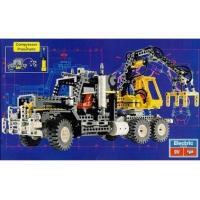 Holy grail is 8858 Auto Engines set. As Balkbird mentioned this set is very rare and expensive and one who has it in mint boxed condition should consider him/herself very lucky. Dream set would be European style garbage truck, cement mixer, asphalting machine, well-driller truck... Regret not buying 41999 at MSRP and buying 8285 at MSRP. My most wanted (and nowhere to find) set is a boxed 858/8858 Auto Engines. ^ Exactly. I always find it strange when someone on this forum roughly criticizes TLG designers not putting this or that function into the model. I'm sure they could easily stand the function competition with the best MOCers in the world but they have to deal with special boundaries and with higher quality requirements. When there is a function left out from a model sure there is good reason for doing so (even instruction comes fom Porsche HQ). On the other hand TLG could improve it's communication when there is a fault with the model that is evident to everyone else. Which set do you love to rebuild, and why? 8480 Space Shuttle, 8868 Air Tech Claw Rig, 8880 Supercar, 8860 Auto Chassis, 8094 Control Centre, 8854 Power Crane, 8043 Excavator I rebuilt these sets several times. Maybe I am a bit old and love studded Technic too much. 8043 is king of studless Technic no doubt.